Equipped with its own microconroller, the NXT ultrasonic sensor is able to accurately measure the distance between itself and an object that is in its path. It has an emitter and receiver. The emitter generates an ultrasonic sound that is "chirped" from a piezo crystal microphone-like element. This chirp has a fequency of 40 kHz and a sound level of 110 dB when measured at 30 cm. Once this sound wave reaches an object, it is reflected back to the sensor. This reflection is called an echo. Once this echo has been detected, the onboard microcontroller calculates the amount of time that has elapsed between the initial chipr and the reception of the return echo. Emissions ranging from single chirps to time-delayed "bursts" of chirps can be programmed into the Brick. The spacings of these bursts can be controlled between 80 msec and 2.5 s. The default burst rate is 10 - 15 bursts per second. A deflection of approx. -10 to +10 cm either side of the sensor's centerline will rpoduce valid measurements. Degradation of distances greater than 78 cm. Arduino Duemilanove, Uno or100% compatible board, you will be using pins A4 for SDA (data) and A5 for SCL (clock). 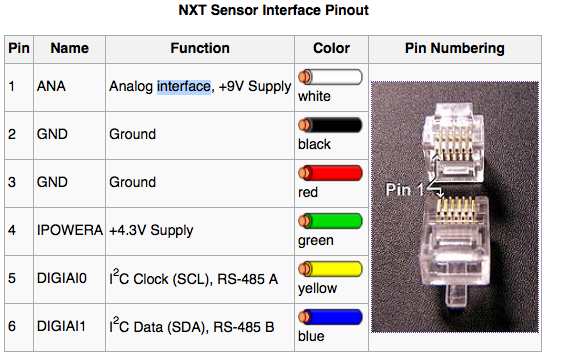 So, from the NXT cable, pin 5 from the NXT cable plugs into A5 on the Arduino and pin 6 from the NXT cable plugs into A4 on the Arduino. How do we interface to either of these options using Matlab? Does the XBee interface as a serial port? Does the receiver?